The Honorable Nassir Ali Shire, Ex-Chairperson of Somaliland’s House of Representatives’ Public Accounts Sub-Committee (PAC), correcting obliquely interpreted references to the world-class remittance company based on a report he made public early August, classified Dahabshiil as above reproach. MP Nassir never directly accused Dahabshiil but the fact that he would bring up the name in his frequent press conferences in reference to other institutions led some detractors to take ill advantage of the fact. 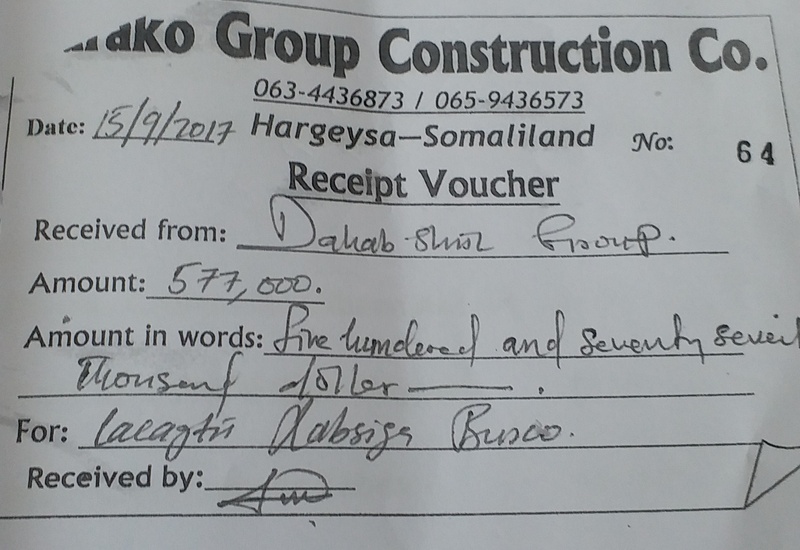 Copy of Al Baraka receipt made to Dahabshiil for US$577 000. PAC, not knowing that the money went directly to the company accused the then Minister of Public Works of short-changing the deal, saying the Minister gave the company only US$540000 – which was later challenged and fully repudiated.PAC, also, unclearly made a reference to a discount made in the sale deal. Again, it was established that the amount referred to by the report was, in fact, an amount the government earmarked for the relocation of residents and squatters living on the government plot, as most of them were officers and NCOs of the Somaliland police force. Dahabshiil has become a byname of trust, efficiency, and thoughtfulness to customers and at locations it operated in all over the world. The Company has been internationally certified as a compliant entity which fully implements not only all major financial regulations but those peculiar to each locality and country which it serves.